This slow cooker barbecue recipe is an easy meal in one pot, and it's a breeze to put together. This recipe also works beautifully with a chuck roast instead of beef short ribs. 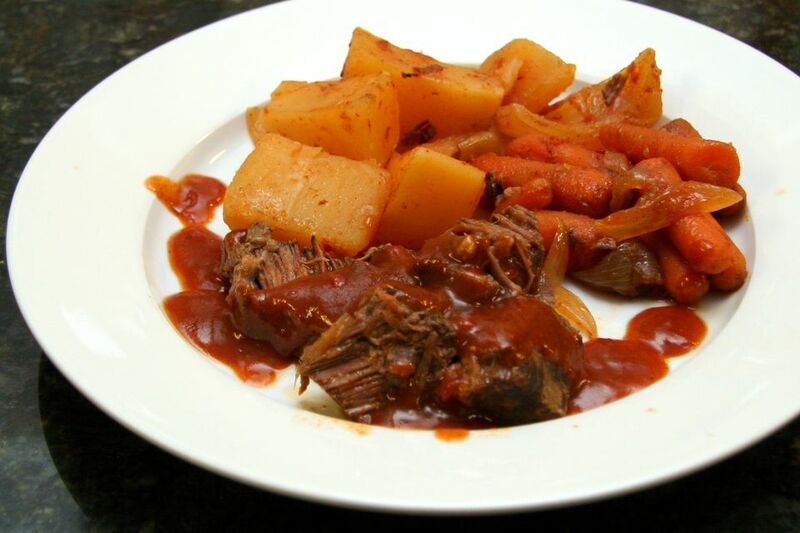 Put the potatoes and carrots in a large slow cooker; top with the onion wedges then the beef. Combine the ketchup, 1/4 cup water, vinegar, paprika, chili powder, mustard, garlic powder, Worcestershire sauce, and salt. Pour over the beef. Cover and cook on low for 8 to 10 hours, or high for 4 to 5 hours. Transfer the juices to a saucepan and simmer for 5 minutes. Combine the cornstarch with 1/4 cup water, stirring until the mixture is smooth. Pour into the simmering juices and cook, stirring, until thickened, about 1 minute. Serve the beef and vegetables with the thickened sauce.